The crew of Soyuz TMA-10M poses in front of their spacecraft in Baikonur on Sept. 14, 2013. Left to right: A NASA astronaut Michael Hopkins and Russian cosmonauts Oleg Kotov and Sergei Ryazansky. Credit: Gagarin Training Center. The Soyuz TMA-10M spacecraft (production number 710, ISS mission 36S) was scheduled for launch on Sept. 26, 2013, on a mission of delivering three members of the International Space Station, ISS, crew, who represented the 37th and 38th long-duration expeditions onboard the orbiting outpost. A NASA astronaut and two Russian cosmonauts were expected to remain onboard the ISS until March 2014 and return to Earth onboard the same spacecraft after logging 168 days in space. The launch of the mission was previously planned for Sept. 30, 2013. In preparation for the launch, a Soyuz-FG rocket was rolled out from the assembly building at Site 112 in Baikonur Cosmodrome, Kazakhstan, to the launch pad No. 5 at Site 1. The liftoff of the Soyuz-FG rocket with the Soyuz TMA-10M spacecraft took place as scheduled on Sept. 26, 2013, at 00:58:50 Moscow Time (4:58 p.m. EST on Sept. 25, 2013). Following a 528-second standard ascent profile to a 200 by 242-kilometer orbit with an inclination 51.6 degrees toward the Equator, the 7,220-kilogram spacecraft is expected to follow a four-orbit rendezvous profile, conducting one engine firing during the first orbit and three additional maneuvers during the second orbit. The docking at the space station's MIM2 Poisk module of the Russian segment, was scheduled at 06:48:11 Moscow Time on the day of the launch (10:48 p.m. EST on September 25). However, Soyuz TMA-10M started the final approach slightly ahead of schedule, docking successfully at 10:45 p.m. EST, or around three minutes ahead of schedule. Two Russian cosmonauts clad in Orlan spacesuits conducted an out-of-this-world hand-off of the Olympic torch at the start of 5-hour, 50-minute spacewalk on November 9, 2013, to perform maintenance on the ISS, NASA announced. Expedition 37 Flight Engineers Oleg Kotov and Sergey Ryazanskiy opened the hatch to the Pirs docking compartment at 9:34 a.m. EST and floated outside to begin a photo opportunity with the unlit torch. 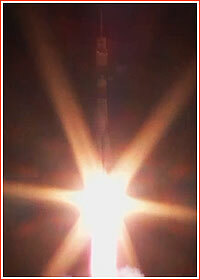 The Olympic torch arrived at the space station on November 7, aboard Soyuz TMA-11M. On Nov. 10, the torch was to be returned to Earth aboard Soyuz TMA-09M along with Expedition 37 Commander Fyodor Yurchikhin and Flight Engineers Karen Nyberg and Luca Parmitano. The torch was expected to be used to light the Olympic flame at the Feb. 7 opening ceremonies of the 2014 Winter Olympic Games in Sochi, Russia. After Kotov and Ryazanskiy completed their photo and video session with the torch outside the station, they stowed it back inside the airlock and proceeded with the remainder of their chores. The two spacewalkers translated out to the hull of the Zvezda service module to continue the set up of a combination extravehicular activity workstation and biaxial pointing platform that was installed during an Expedition 36 spacewalk on Aug. 22. After installing some handrails on the workstation, Kotov and Ryazanskiy loosened a trio of bolts and removed a launch bracket from the pointing platform. A high resolution camera system will be installed on the platform during a spacewalk targeted for December 2013. The installation of a foot restraint on the mounting seat of the workstation was deferred to a future spacewalk after the spacewalkers noticed some issues with its alignment. For their final planned task, Kotov and Ryazanskiy deactivated the Radiometria experiment package on Zvezda. Designed to collect information useful in seismic forecasts and earthquake predictions, Radiometria was installed on the station during an Expedition 26 spacewalk in February 2011. After securing the experiment's cables, the spacewalkers headed back to the airlock to wrap up the excursion. The task to fold down and restrain Radiometria's antenna was deferred to a future spacewalk. 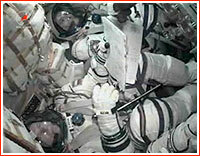 The duo closed the Pirs hatch at 3:24 p.m., marking the official end of the spacewalk. During the spacewalk, Yurchikhin, Parmitano and Nyberg were isolated to their Soyuz TMA-09M spacecraft and Zvezda, while Flight Engineer Mike Hopkins was restricted to the Poisk module and his Soyuz TMA-10M craft. The remaining three crew members -- Mastracchio, Wakata and Tyurin – had access to much of the remaining area of the station, including the Zarya module, their Soyuz TMA-11M vehicle and the Rassvet module to which it is docked, as well as the entirety of the U.S. segment of the station. The spacewalk on Nov. 9 was the 174th in support of space station assembly and maintenance, the fourth in Kotov's career and the first for Ryazanskiy. Kotov, who was designated EV1 for the spacewalk wore the suit with red stripes. Ryazanskiy, EV2, wore the suit marked with blue stripes. This was the eighth spacewalk conducted at the station in 2013. In December, Tyurin was scheduled to accompany Kotov on his fifth spacewalk, NASA announced. On December 28, 2013, at 17:00 Moscow Time, Oleg Kotov and Sergey Ryazanskiy dressed in Orlan spacesuits started an 8-hour, 7-minute spacewalk which lasted 8 hours and 7 minutes. Its main goal was the installation of photographic equipment on the exterior of the ISS. They promptly installed a pair of high-fidelity cameras as part of a Canadian commercial endeavor designed to downlink Earth observation imagery – but had to remove them later due to an unspecified problem that prevented telemetry from being received on the ground by Russian flight controllers. As planned, Kotov and Ryazanskiy attached the two cameras on a combination biaxial pointing platform and spacewalk workstation that was installed on the Zvezda service module during a spacewalk on November 9, 2013. 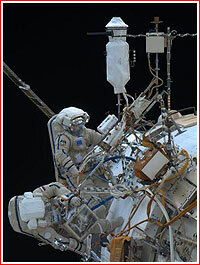 Kotov and Ryazanskiy also installed a foot restraint to the workstation. 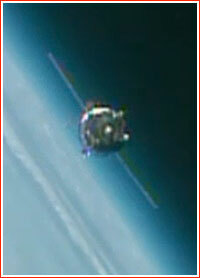 After routing data and telemetry cables for the medium resolution camera, Kotov jettisoned the cable reel opposite of the station’s direction of travel for disposal. When the flight control team at the Russian Mission Control Center outside Moscow did not see the expected telemetry and electrical connectivity from the medium and high resolution cameras, Kotov and Ryazanskiy were directed to remove the cameras and return them to the airlock for further analysis. The spacewalkers also were instructed to take detailed photographs of the electrical connectors mated earlier for additional review. In addition to their work with the two cameras, the spacewalkers also removed the Vsplesk experiment package and jettisoned it. Vsplesk, installed during an Expedition 17 spacewalk in July 2008, was designed to monitor seismic effects using high-energy particle streams in the near-Earth environment. Kotov and Ryazanskiy replaced it with hardware for a more sophisticated earthquake-monitoring experiment, Seismoprognoz, which they attached to a Zvezda handrail. Because of the issue in activating the cameras, Kotov and Ryazanskiy did not have time to complete the all of their planned tasks, which included the jettisoning of a frame that once held three Micro-Particles Capturer and Space Environment Exposure Device, MPAC & SEED, units for a Japanese space exposure study and the installation of a payload boom. The December 28 spacewalk eclipsed the record for the longest Russian spacewalk set by Expedition 36 Flight Engineers Fyodor Yurchikhin and Alexander Misurkin, who conducted a 7-hour, 29 minute excursion on Aug. 16. With the completion of his fifth spacewalk, Kotov now has 30 hours and 43 minutes of total spacewalking time. Ryazanskiy has a total of 13 hours and 57 minutes over his two spacewalks. This was the 177th spacewalk in support of space station assembly and maintenance, totaling 1,115 hours, 44 minutes, and the 11th spacewalk this year. During the spacewalk, Flight Engineer Mike Hopkins was restricted to the Poisk module and the Soyuz TMA-10M craft that brought him, Kotov and Ryazanskiy to the complex in September. The remaining three crew members – Flight Engineers Rick Mastracchio, Koichi Wakata and Mikhail Tyurin – had access to the Zarya module and the entirety of the U.S. segment of the station. The December 28 Russian spacewalk was not related to a recent pair of U.S. spacewalks to replace a faulty ammonia coolant pump module. Flight controllers in Houston’s Mission Control successfully restarted the new pump on the night of December 24, following two spacewalks – including a 7-hour, 30-minute excursion December 24 -- by Mastracchio and Hopkins to replace a degraded pump module on the station’s starboard truss. That pump module continues to operate well. The Soyuz TMA-10 spacecraft with Oleg Kotov, Mike Hopkins and Sergey Ryazansky onboard undocked from the Poisk module on March 11, 2014, at 04:02 Moscow Time (8:02 p.m. EDT on March 10). 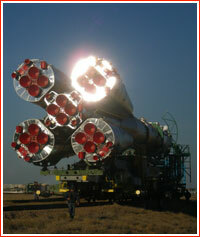 According to the mission control in Korolev, the braking maneuver was scheduled to start at 06:30:20 Moscow Time. Following a nominal reentry, the descent module with its crew landed as scheduled 147 kilometers southeast of the town of Dzezkazgan in Kazakhstan on March 11, 2014, at 07:24 Moscow Time (11:24 p.m. EDT on March 10). The flight of Soyuz TMA-10M lasted 166 days, 6 hours and 26 minutes. The crew logged five and a half months aboard the ISS. Kotov completed his third mission aboard the orbital laboratory for a total of 526 days in space. Hopkins and Ryazansky completed their first space mission each accumulating 166 days in space. During his stay aboard the orbital laboratory, Hopkins conducted a pair of U.S. spacewalks for a total 12 hours and 58 minutes. Ryazansky conducted three Russian spacewalks during his mission working outside the station for 20 hours and five minutes. Packed inside the returning Soyuz TMA-10M spacecraft was gear, personal items and science. Student investigations launched on Orbital Sciences Corporation’s Orbital 1 mission in January also returned with the crew aboard the Soyuz spacecraft. Staying behind were new Expedition 39 Commander Koichi Wakata and Flight Engineers Rick Mastracchio and Mikhail Tyurin. 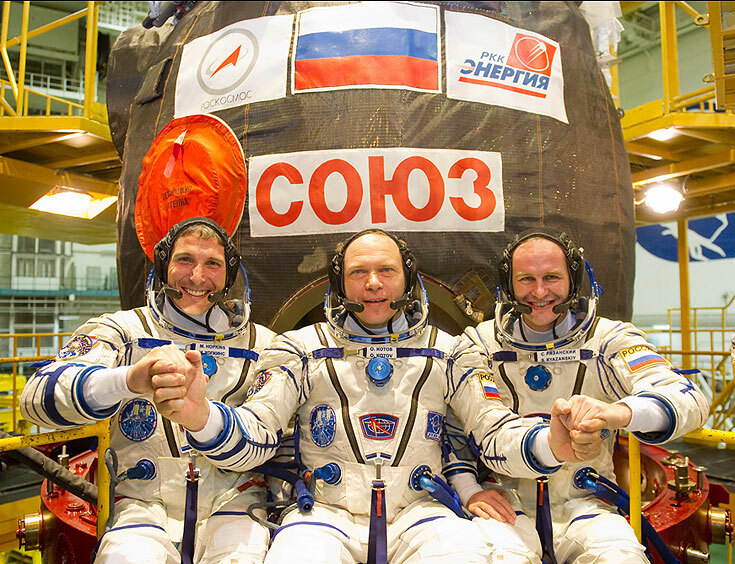 The crew members arrived at the station’s Rassvet module on Nov. 7, 2013, aboard a Soyuz TMA-11M spacecraft. As of March 2014, they were scheduled to return home in mid-May 2014.